Last week, The Sun ran a story about how the CIA wanted to force Britain to hand over the Falkland Islands to Argentina and force British citizens living there to relocate to Scotland. The Daily Mail published a similar story. At best, the stories are sensationalist. At worst, they’re deliberately misrepresenting the truth. The document was obviously written after the Argentinian invasion, and after the British task force sailed to reclaim the islands, but before the ground war began. At this point, the USA was trying to find a diplomatic solution to the crisis. From America’s point of view, two of their allies were fighting each other, and not unreasonably, they wanted to find a peaceful solution that both would accept. Both stories were based on a recently declassified memo. It’s clear that the memo was written as a possible way to resolve the dispute peacefully. Despite the newspapers’ claims, the author doesn’t suggest that repatriated islanders must go to Scotland, it actually says that any that wish to should be allowed to relocate to “the UK or elsewhere under British sovereignty”. Scotland is merely mentioned as a likely choice due to its similarity to the Falklands. 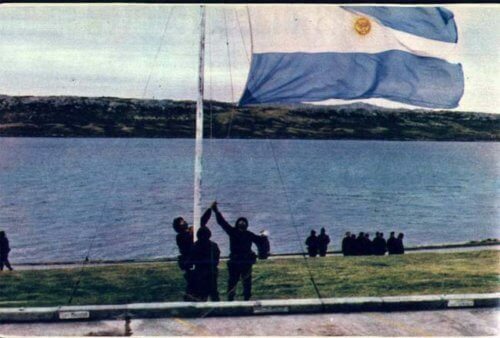 What the memo writer missed was the change in the British attitude to the Falklands. The memo states that the British were prepared to hand over sovereignty to Argentina, and that they had been for some time. Before the invasion, that was true. As recently as 1980, the British Minister of State had put a proposal for transfer of sovereignty to the Islanders. The invasion changed that. Suddenly the British government was determined to keep the islands, and so the proposals had no real chance of being accepted by the British. The memo offers an interesting insight into American assumptions and attitudes at the time, but it’s not a smoking gun, however much tabloid journalists would like to believe otherwise.